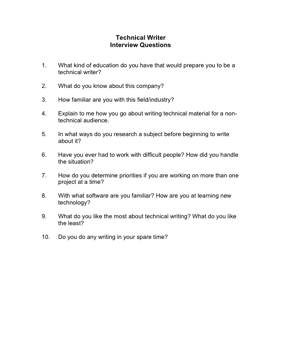 Choose your next Technical Writer with the aid of these helpful interview questions. 1. What kind of education do you have that would prepare you to be a technical writer? 3. How familiar are you with this field/industry? 4. Explain to me how you go about writing technical material for a non-technical audience. 5. In what ways do you research a subject before beginning to write about it? 6. Have you ever had to work with difficult people? How did you handle the situation? 7. How do you determine priorities if you are working on more than one project at a time? 8. With what software are you familiar? How are you at learning new technology? 9. What do you like the most about technical writing? What do you like the least? 10. Do you do any writing in your spare time?